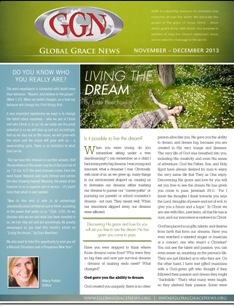 The November – December 2013 Global Grace News, newsletter has been posted, to view this edition, please click on the picture icon of the newsletter for the web PDF version. 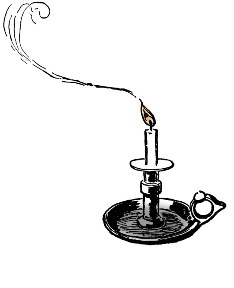 Again some great grace articles. including “Living The Dream” by Evan Beecham. You can Also access Global Grace News by clicking here: Global Grace News You will be blessed. Grace and peace to you! Before We Were Lost In Adam, We Were Found In Him! I bring good tidings of great joy; the gladder the tidings, the greater the joy. The danger was never to exaggerate the good news but rather to underestimate it! The gospel wouldn’t be good news, except that God is good. We would not be forgiven, redeemed, justified, healed, blessed, righteous, holy, or anything, except that God is good. All of these gifts are only good, because the One who gives them is good. Before you were lost in Adam, you were found in Him (Eph 1:4). In today’s message, discover the greatest historical event ever known to man, and the amazing result; the Word became flesh and dwelt among us. Emmanuel, GOD WITH US! Posted on December 23, 2013 October 26, 2016 Author EvanCategories Grace Audio/Video MessagesLeave a comment on Before We Were Lost In Adam, We Were Found In Him! Discover God’s satisfaction with you, and enter into the promise of His rest. Moving from a wilderness experience to His promised land of rest is as simple as what you believe. Right now is our eternal moment with God. Learn to enjoy the “now” with your Father who is one with you forever and loves everything about you. Many times, instead we live in regret of our past, or anxiety concerning our future. This causes guilt and condemnation, which hinders us from enjoying the eternal moment with Our Father. Jesus told us not to worry about tomorrow, because He has your tomorrow’s covered. Cast your cares on Him because He “cares” for YOU, and enjoy this eternal moment with Him. Relax, and let this message encourage you with God’s peace, His love and encouragement that “all is well” in Him. Christmas is rapidly approaching and as I was busy making my list and checking it twice, I suddenly realized I keep increasing my list. Christmas has always been my favorite time throughout the year, and I’ve been known to put up our Christmas tree in August. When I was a little girl, my present was a stocking with fruit in it, and my uncle John consistently brought me a box of Lifesaver candy. The girls in my class would be talking about their new dolls, which seemed unusual to me. When your loved your not always aware of the material things, I was loved and with that love came the stocking and candy. To me that was what Christmas was all about. Over the last couple weeks, I have been watching Christmas movies, and my favorite movie is an old one called, “It Happened on 5th Ave,” It has so much love and character in it, if you haven’t seen it, you should put it on your must watch list. Many of the new Christmas movies could easily be shown on Valentine’s day, with people seeking unconditional love, acceptance, and that one special gift. Isn’t that what we all want. I want you to know that no matter what you are going through at this time of the year, You are Loved. Not only loved but immensely loved and accepted 24/7 by God! God values you, and He says to you, that you are His masterpiece, His dwelling. As we have received Jesus and His special gift to us, in return, we become His special gift. A child born of love from above. He will never let go of you or relax His hold on you. For God wraps His arms around you in His Love. God is Love and Love is all He gives you. He is there with you to encourage you and lift you up in who you really are in Him. Totally, and absolutely loved! Our prayer from all of us at Grace Without Measure, to you, is that you may know the love of Christ, which passes human knowledge. That you would be filled to overflowing with all the fullness of God. To be persuaded that God your Father who loves you immensely is able to do exceedingly above all your wildest dreams, and above all you could ever ask or think for it is His extreme love at work in you that demonstrates His great Love, He has for you. Receive this love and you will receive the greatest the most special gift. It is His full acceptance and unconditional love for you! Posted on December 6, 2013 October 26, 2016 Author Sue BeechamCategories Abundance of Grace1 Comment on That Special Christmas Gift! As A Man Believes; Life Born In You! As a man believes in his heart, so is he. What we believe births in us how we make our decisions, and our reality about ourselves. In order for the truth to set us free, we must understand and believe it. In this message relax and enjoy the revelation of who you are in Christ, because of the finished work of the cross, and how what you believe greatly impacts entering His rest. Posted on December 2, 2013 October 26, 2016 Author EvanCategories Grace Audio/Video MessagesLeave a comment on As A Man Believes; Life Born In You!